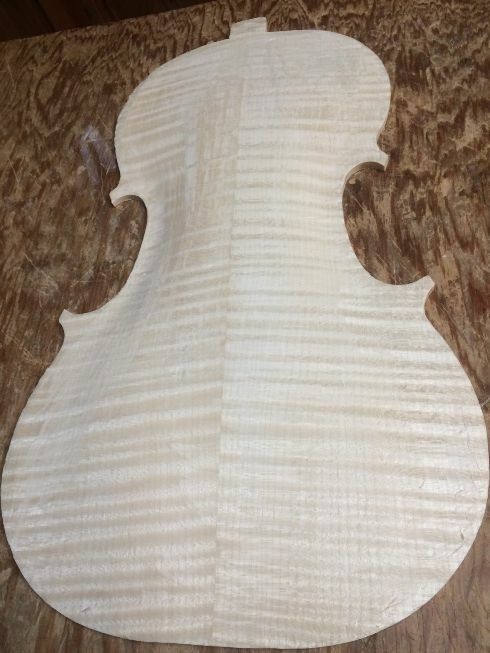 Maple is a lot tougher to carve than Spruce is, and European Maple is tougher than the domestic maples. But it has to be done, so, we get going on it. 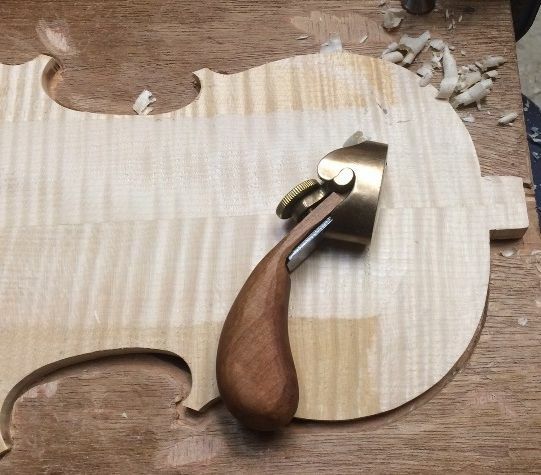 I chose to carve the back plate for the Titian model violin, first. Beginning Planing, using a toothed plane. 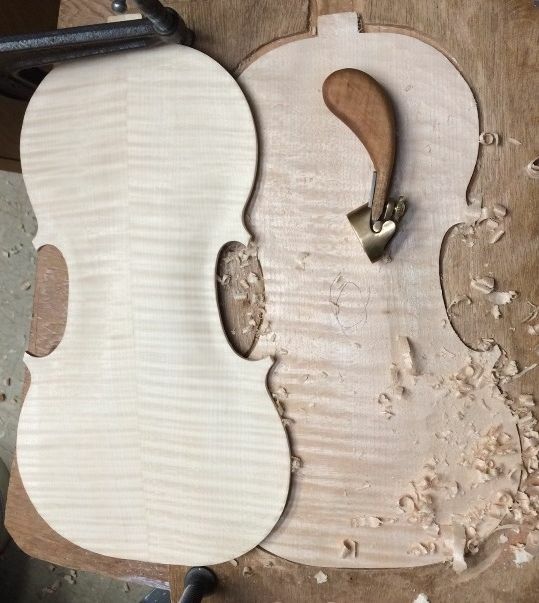 Later, as I came nearer to having the plate correctly shaped, I switched to a smooth, curved-sole finger plane. I have two main toothed planes, to which I have affixed wooden handles, so as to distribute the force across my palm, instead of concentrating it on my fingers and thumb. I don’t need the handles as much, using the smooth planes, because I am usually making shallower cuts. Checking relative curvature with a straight bar. The arching is still pretty rough, but it is beginning to take shape. 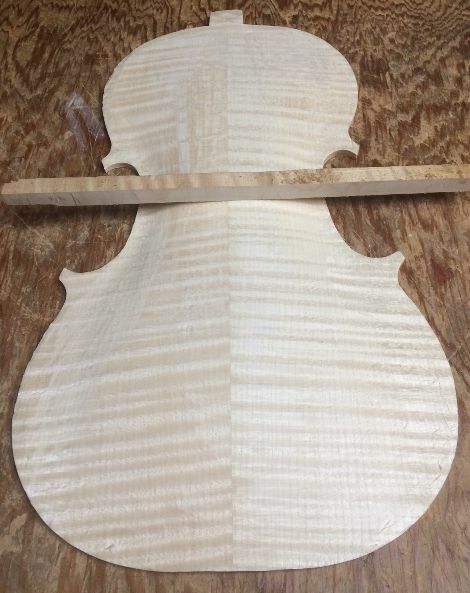 After the shape is nearly complete, I switch to scrapers, and try to accurately match my arching templates. Finally, I use a flexible scraper with which to smooth all transitions, and leave a finished surface. It is interesting to see the different wood colors. I bought both from the same source, but they are certainly not from the same tree. That is OK. 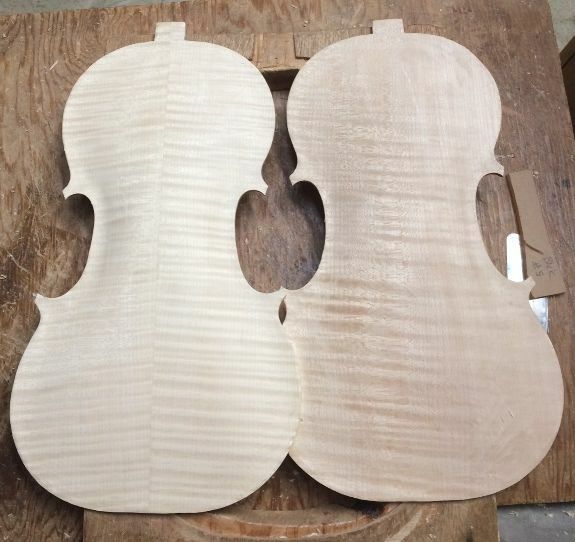 Both are good European Maple, and will work very well. Both plates nearly complete–the Plowden plate still needs work. I was getting too tired to go further this evening. My hands were beginning to hurt, so it was time to call it a day. 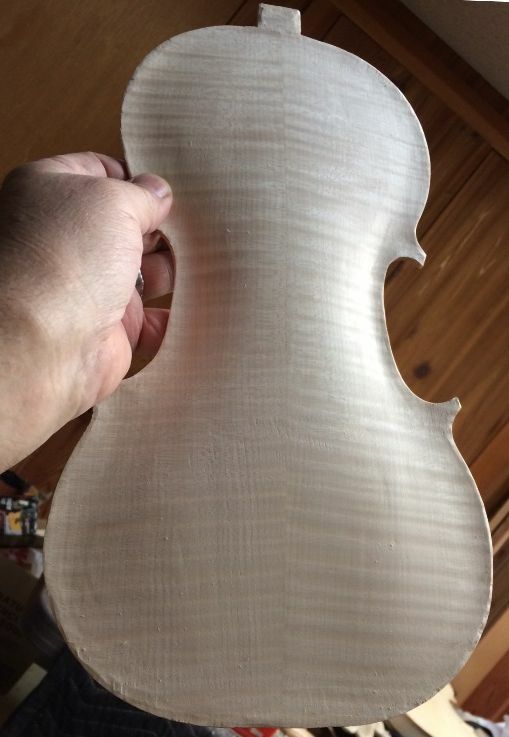 After I finish the scraping and shaping of the Plowden back plate, it will be time to begin the interior arching (graduation). Also, I ordered a different pair of neck blocks, because I realized that the pair of neck blocks I had were actually Viola neck blocks, and I hated to waste them. So, when the new blocks arrive, I will also lay out and begin carving the two necks and scrolls. Thanks, Miss Maryanne! They are coming along exasperatingly slowly, but they are progressing. The new neck blocks arrived today, so I hope to get going on them soon.